Since my last outing with the ice cream machine went so incredibly well, I decided to make a second batch. Mr. Bacon’s favourite is mint chocolate chip so I decided to kick it up a notch and use chopped Andes mints instead of plain chocolate chips. I based my version on this recipe from Chew Out Loud. The result got a rousing thumbs up so I hope you like it too. In a large bowl, whisk together the milk and sugar until the sugar has totally dissolved. Stir in the cream, peppermint and food colouring. Pour into your ice cream maker and follow the manufacturer’s instructions to freeze the batch. When finished, fold in the chocolate and place it into the freezer to firm up. Thanks! You should try it out! Thanks for trying out a mint chocolate chip recipe for me! I had been searching for the perfect one to use some Andes mint chips with in the fall and never did try one. 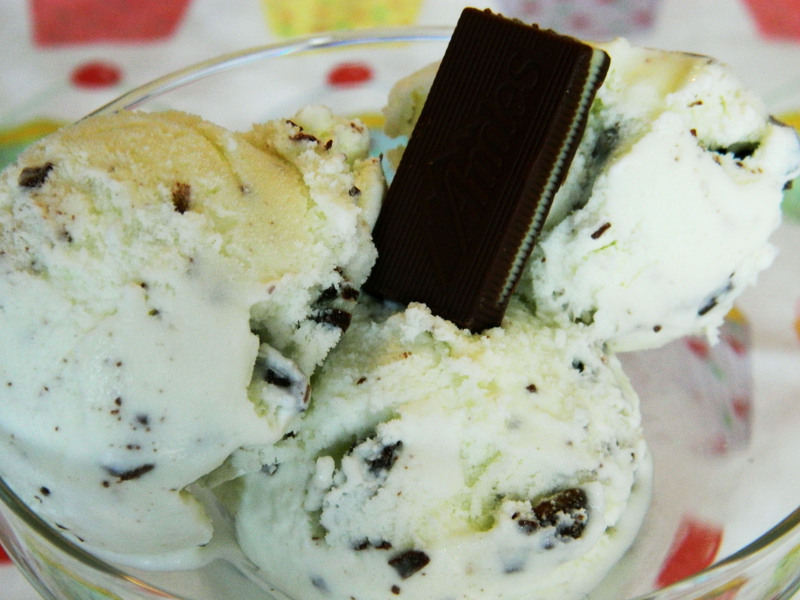 I’ve only ever made the ‘real’ mint ice cream but want to try this ASAP!!! Glad I could play guinea pig for you 🙂 I found that 1.5 tsp was the perfect amount of minty-ness. Not too much bite.